Are you Team Coco? Of course you are. 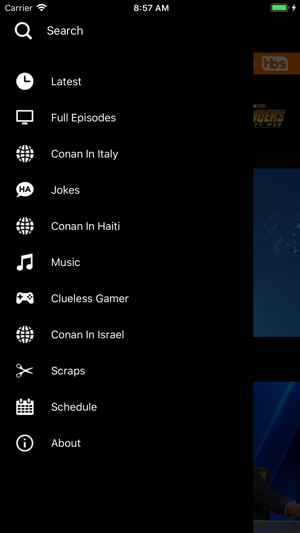 So download the official app for iPhone and iPad to take CONAN on TBS anywhere you go. The Team Coco app has the full episodes you want, plus all the latest video clips of celebrity interviews, comedy sketches, musical performances, and web exclusives. 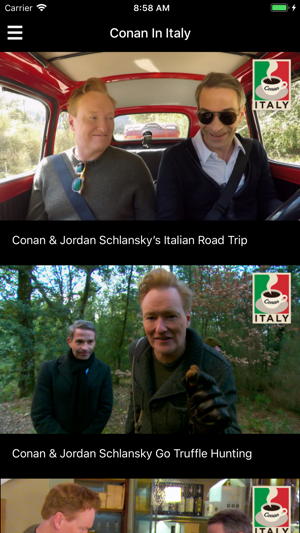 Plus, the amazing CONAN360° feature takes you to the center of the late night action. 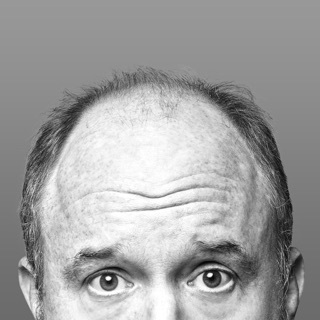 You can also get a heads-up on which guests will be appearing on CONAN, read thousands of monologue jokes, and catch the latest Twitter dispatches from Conan O’Brien and the rest of the Team Coco crew. It’s the total Conan O’Brien experience you’ve been waiting for - available now for iPod touch, iPhone and iPad. 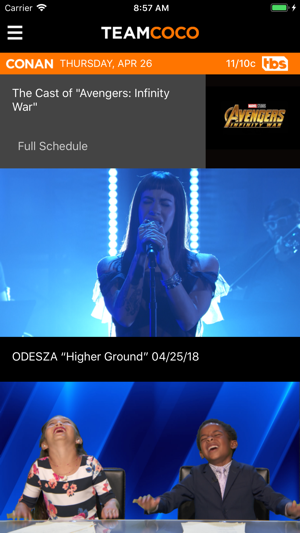 It is the last week of March 2019 and the issue with the next clip automatically playing still has not bee addressed. The wide screen issue has fortunately been addressed. I cannot access more than three full episodes of the show at a time. It still automatically pulls up the next clip and I can’t control what I watch next when using on my iPad. I can only stop the next video (that I did not choose) by closing the app entirely. It keeps me from watching more clips. Please fix this! The app used to be great and very easy to use. Sadly, this is no longer the case. It also has a wide screen view, which is fine, except the extra space on the top and bottom are a screenshot of the clip I’m watching (instead of being a solid, non-distracting color). Love Conan, and since getting rid of cable, this is the only way I can watch his show. Unfortunately, this app is not very good. At least one episode a week will not play on my iPad. Currently, all available episodes will not play, which is a new record. I don’t have this problem with any other app. Also, it is difficult to forward and reverse within an episode and most of the time when you try, the episode starts over from the beginning and then you have to get back to the point you were at before by guessing how far to move the slider, as there is no preview window to see where the video is at as you do so. 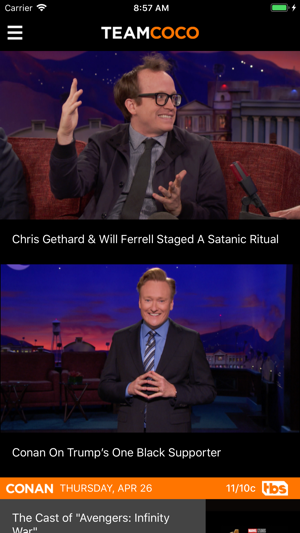 It’s really frustrating for a Conan fan. 2 stars is being generous. They just updated the app so now video is full screen, finally, instead of floating over the image of the guests for that show, but now it has live Closed Captioning that I can’t turn off which is super distracting and full of spelling errors. Update: no sound on iPhone app. At all. What the hell? You also can’t hit pause or unplug your audio connection without the entire video starting over or skipping to the next clip. It would also be nice if full episodes were around longer than a week. If it’s Monday, and I’m trying to watch last Monday’s episode, it won’t even play. I need to watch it before that day and it’s like this for every episode on any day. At least have the full guest interviews up instead of just clips from the interviews. I’d be willing to pay for access to that.